Hiccups - body, last, causes, Are Hiccups Dangerous? 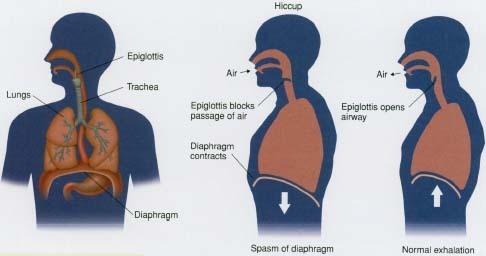 Hiccups occur when the diaphragm * suddenly contracts during breathing. The vocal cords quickly close, and an odd sound comes from the throat. Hiccups are involuntary. Their cause is not known, and hiccups do not seem to serve any useful purpose. Hiccups occur when the diaphragm and lungs suddenly contract during breathing. babies and fetuses) for a minute or two and then pass. There are, however, cases of prolonged hiccuping that can be dangerous, especially for people who are ill from other causes and who may become exhausted if they do not seek medical treatment. What Are the Different Types of Hiccups? Hiccups are classified into several categories. A "hiccup bout" can last from several seconds to several days. A "persistent hiccup" is one that lasts for several days or weeks. Hiccups lasting more than a month are called "intractable." In rare cases, intractable hiccups may continue for years. * diaphragm (DY-a-fram) is the muscle that separates the chest and abdominal cavities. It is the chief muscle used in breathing. Everyone seems to have a favorite cure for hiccups, but usually they just go away by themselves. In severe cases of hiccups, doctors may try to block the hiccup process (also called the "hiccup arc" or "pathway") by stimulating parts of the respiratory (breathing) system or by prescribing medications to relax the muscles involved. When all else fails, surgery is done to block the nerve signals from the phrenic (FREN-ik) nerve to the diaphragm. The purpose of this procedure is to paralyze part of the diaphragm. There is a medical term for when a person has just one very loud hiccup. Are you able to tell me what it is? I heard it once, but can not recall the term.